There are limited sponsorship options available on Dreamgrow.com. This website is a popular social media and content marketing blog. On our website, you can reach marketing professionals and enthusiasts alike. Our traffic has increased more 4 times in the last year and continues to grow. We have more than 214,000 sessions per month (February 2018) and 188 thousand unique users. Advertising on our blog is easy, cost effective, and most importantly targeted to marketing professionals. 280x560px banner which located at the top of the left sidebar. We have 3 rotating banners, giving equal exposure to all advertisers. Price – 487 USD per month. 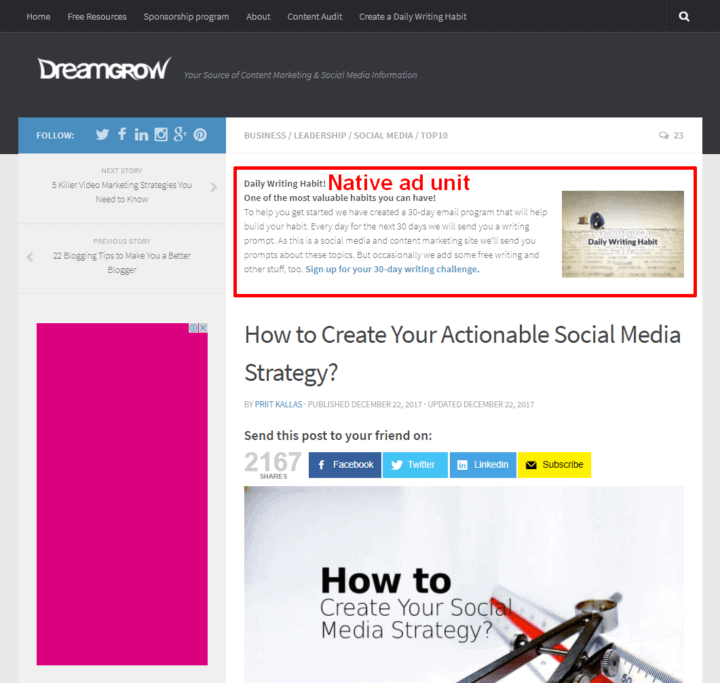 Native ad unit at the top of blog posts We have 3 rotating units, giving equal exposure to all advertisers. Minimum period is 3 months. All ads need to be paid in advance. If you subscribers for 5 months you will get a free bonus month. Book your advertising space by sending us an email on [email protected]. As we have very limited inventory we may not be able to serve you when all the ad units are sold out.